Kalimpong: Over hundred activists of the Jana Andolan Party were detained by Delhi police on Friday when they were undertaking a march to Parliament demanding a discussion on Gorkhaland in the House and convening of tripartite talks on the issue. Tashi Sherpa, the JAP spokesman, said the marchers had started from near Jantar Mantar and were on their way to the Parliament House when they were stopped by the police near gate no. 2 of the heavily guarded complex. "When our supporters broke the police barricade, they were lathi-charged and arrested. They were then taken to the Mandir Marg police station and are still being detained there," he said. The JAP spokesman said its activists from different parts of the hills had reached Delhi in batches earlier in the week to take part in the march. "Most of them have their heads tonsured in a symbolic protest against the high-handedness of the Bengal government against our people in the hills," he said. Sherpa said the JAP would continue with its "March to Parliament" over the next few days and even senior leaders, including party president Harka Bahadur Chhetri, would join them. "We are determined to make our voices heard in Parliament. Our party workers will again undertake the march in the next few days. Our national bureau members will be reaching Delhi to join the marchers," he said. This is the second protest march organised by the JAP in Delhi. Earlier in August, during the height of the latest agitation for Gorkhaland in the hills, the JAP had organised similar "March to Parliament" programme there. Sherpa said the JAP's two-point demand was discussion on Gorkhaland in Parliament and holding of tri-partite talks on the issue at the earliest. "All other parties have forgotten about the tri-partite talks. We, however, insist that such a dialogue must take place to resolve the separate state issue once and for all. During the first two rounds of the bipartite talks called by the state government during the recent agitation in the hills, we had made our stand very clear. It was only because there was no movement on the tripartite process that we did not attend the subsequent rounds of bipartite talks," he said. The JAP spokesman said party leaders during the stay in Delhi would try and meet as many parliamentarians as possible to canvass support for their demand to hold a discussion on Gorkhaland in Parliament. "Our team will also try and meet the Central ministers." 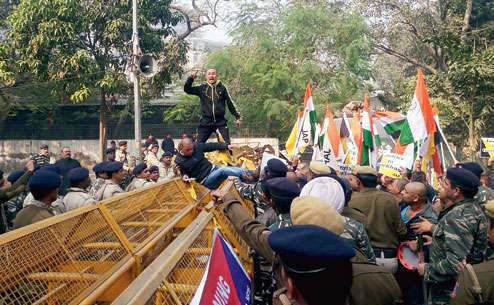 Over hundred activists of the Jana Andolan Party were detained by Delhi police on Friday when they were undertaking a march to Parliament demanding a discussion on Gorkhaland in the House and convening of tripartite talks on the issue.